Knysna Golf Club was formed in 1909 and members have been playing at the club’s current location – where the fairways back onto the Knysna Lagoon – for over sixty years. George Strydom began the construction of the original 9-holer in 1949 with Jock Fraser finishing the job two years later. Another twenty years would pass before the course was doubled in size to a full 18-hole layout by Harold Thesen. An extensive upgrade program was embarked upon in the mid 1990s when Phillip Basson reconstructed the greens to USGA standard. Soon after, new water features were introduced and extra bunkers installed to augment the golfing challenge. An upgraded clubhouse was completed in May 2007, in good time for the club’s centenary celebrations, but unfortunately, a fire in January 2010 destroyed the new building. To the eternal credit of the club members, the clubhouse was rebuilt in double quick time and a replacement building was in place by April 2011. The eighteen holes at Knysna have been overshadowed by the course at Pezula since it opened on an adjacent property in 2000 (and the even more recent layout at nearby Simola has also put Knysna in the shade) but the club is clearly doing its very best to compete against these other modern golf facilities. Knysna Golf Club is in the process of a major re-design with many of the holes being changed to incorporate new fairway and green-side bunkers, extended water hazards and re-shaped fairways. I'm told that about 70 new trees have been planted recently to add greater definition to some of the holes. When the changes are complete Knysna will be an even better course visually. It has always been one of the most popular in South Africa and from what I have seen recently it will become a truly great golfing experience. Knysna is an exceptional local golf club that's every bit as good as it's more upmarket neighbours Pezula and Simola. It's every bit as challenging as any course in the area, and offers some of the most spectacular views across the lagoons towards Knysna itself and out towards the Heads. The course itself is a mix of what you might call "parkland and water" with most of the holes protected in some way by the dreaded H20! However, that said there's often plenty of space for a wayward drive, but those that spray a little might struggle! All of the greens were in excellent condition when we played and putts all rolled very true. It's clear that Knysna has benefited from tourism with the money being put back into the clubhouse and course. The great news is that it's still a local club with a local feel to it. Much like George Golf Club further down the Garden Route, I'd strongly recommend it as an great anti-resort experience. You won't be disappointed! I played Kynsna plus Pezula and Simola recently and have played all 3 several times. There is no comparison. Pezula is the best (assuming there is no sea mist) and some of the back 9 at Somola are ordinary but both are in a different league to Knysna. It is a very friendly members club with a great clubhouse (due to the fire) but the course is average and no better (3 balls). 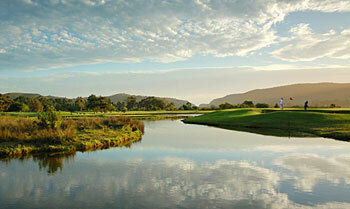 One of the 'knicest' things about Knysna Golf Club is its pleasant lagoon-side location. Being close to the water's edge, it's flat and easy to walk. No need for a buggy unless the weather's hot. But don't be deceived by the flatness of the terrain. There are plenty of trees, lots of water to negotiate and tricky raised greens. The latter calls for an accurate short game or you run the constant risk of coming up well short of the putting surface or sending the ball skipping through the green. The signature hole is the (par 3) 8th. At 157 metres from the men's tee, the hole is visually attractive but the island green presents a rather terrifying prospect - especially in windy conditions. The rest of the course requires accuracy off the tee and the ability to focus on the fairways, not the numerous water hazards! The greens are well kept and consistent while the water features and gardens behind the 18th green and 10th tee delight the eye. Although the club was founded over 100 years ago, it now boasts one of the most modern, thoughtfully designed and comfortable clubhouses in the Western Cape - if not the whole country! The change rooms are spacious, well appointed and immaculately maintained and the bar and halfway facilities first-class. It's a friendly and welcoming club with a huge membership, made up of locals and a great many 'Swallows' who escape to the Southern Cape from the cold European winters every year. What great pity that golf tourists often overlook Knysna GC in favour of the town's two (and much more expensive) resort courses - Pezula and Simola. It's a great tribute to the club that it's been selected to host the prestigious Nomads' National Championships in March 2016. Play Knysna soon and you'll understand why. I agree about Knysna's rating. It is way better than a lot of courses I have played in SA and I don't really understand how it can be so low on the list. Completely agree with this review and I would rate it much higher.